345 Park Avenue is also known as the Bristol-Myers Squibb building. The skyscraper is the headquarters of Bristol-Myers Squibb, as well as KPMG LLP. 345 Park Avenue was designed by architectural firm Emory Roth & Sons. Standing at 44 stories high, the Bristol-Myers Squibb building is the 64th tallest building in New York. 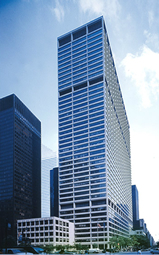 345 Park Avenue was completed in 1969. Things are looking up for stable, stalwart landlords like Rudin, who can still afford juicy incentive packages for the right tenants. 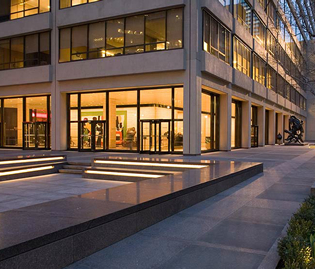 This prime Park Avenue owner-occupied office tower in the heart of the Plaza District is ideal location for law firms, financial institutions, corporate headquarters and CPA's. The large efficient floors at 345 Park Avenue offer flexibility to accomodate any type of office layout: an open plan or one with as many as 60 perimeter offices that still leaves ample interior areas for conference and support space. Additional entrance on Lexington Avenue. For more information on 345 Park Avenue, contact a New York Office Space broker today. • Slan to Slab 12' 8"
The shear mass of the exterior of 345 Park Avenue looms over the surrounding neighborhood which also hosts the General Electric Tower to its south while the Seagram Building to the north stands at its other side. The bold white appearance of the building was chosen to contrast against its neighbors most notably the Seagram’s. Of the surrounding area there are many fore & background buildings that can be seen; those at the forefront are the remarkable tributes to the art of modern architecture whose dominating presence on the city landscape has no equal. The properties in at the hind add value by complimenting the vista by adding balance to the landscape. The property at 345 Park Avenue doesn’t fit either mold – but rather stands as its own distinct presence pointed by its white stark concrete façade matched to dark glass panes. Creating a difference by which the focus is brought away from the Seagram’s to that of the Park Avenue property instead. The building’s frontage furthermore is differentiated by its angular concrete components that seemly meet the sky though not as raised or rough as the former Pan Am building; all in all the property at 345 stands as a behemoth to both function and design.